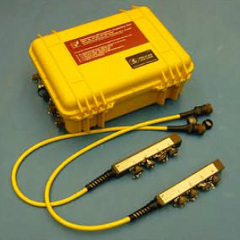 The Terrascience Microseismic Acquisition unit (TMA) is a 24-bit digital data acquisition system. It is a part of Terrascience Systems’ line of microseismic monitoring products. This equipment builds upon the experience gained in the design and deployment of Terrascience Systems’ structural monitoring equipment for oil and gas platforms and marine vessels over the last 25 years. The TMA units are specifically designed for high performance data acquisition applications. The standard configuration consists of 4 to 24 channels of 24 bit A/D modules in 4 channel increments. Each channel employs an extremely low noise 4th-order Delta-Sigma modulator and programmable digital filter. This gives an effective noise free resolution of >23 bits at 100 samples per second and >18 bits at 2000 samples per second. Also available is the portable version of the TMA-24, the TMA-24P which is shown in the featured image.